When I began commuting to work by bike 15 years ago in Maine, I didn’t intend to ride through the winter. It wasn’t until about mid-February of that year that I realized: Hey! I’m still riding! Maybe I really will go all winter. And I did! Not that it’s always easy. There’s a lot to get used to. Dressing for the weather takes practice, and a lot of experimentation. One bad experience early on found me not well prepared for single-digit temperatures. My commute is five miles one way. About a mile down the road, both the bike cables and my body started to freeze. I turned around. By the time I got back home, I stumbled shivering through the door and onto the couch, where my wonderful wife brought blankets and served me hot tea until I got warm again. Then I drove the car to work. Oh well. 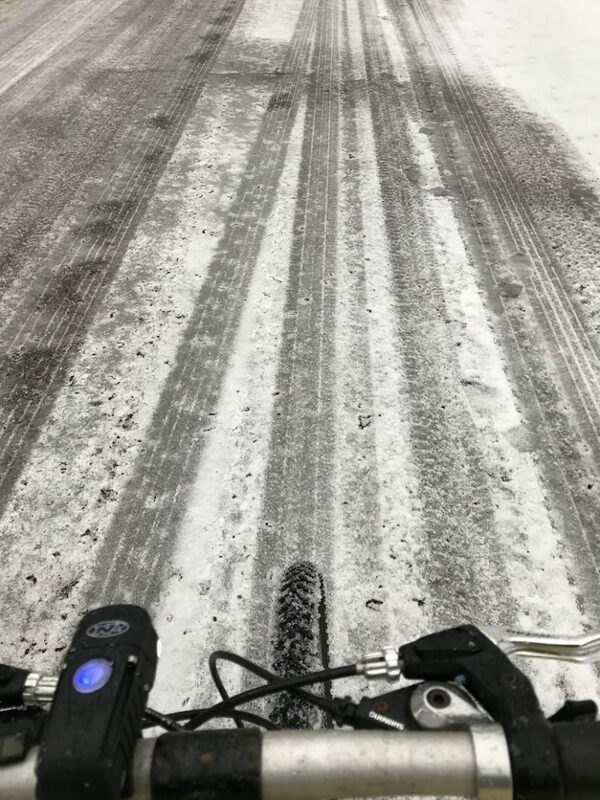 My colleague Josh Stevens in Michigan wrote a great column last November which covers the basics of winter commuting very well, especially clothing, lights, and tires, so I need not re-invent those wheels here. 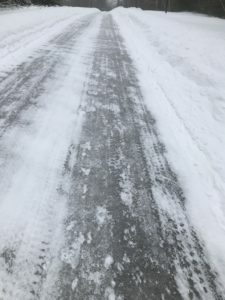 You may also be interested in an article I wrote here a few years ago about Staying Safe in the Snow, in response to concerns I heard from my co-workers during a particularly snowy month. 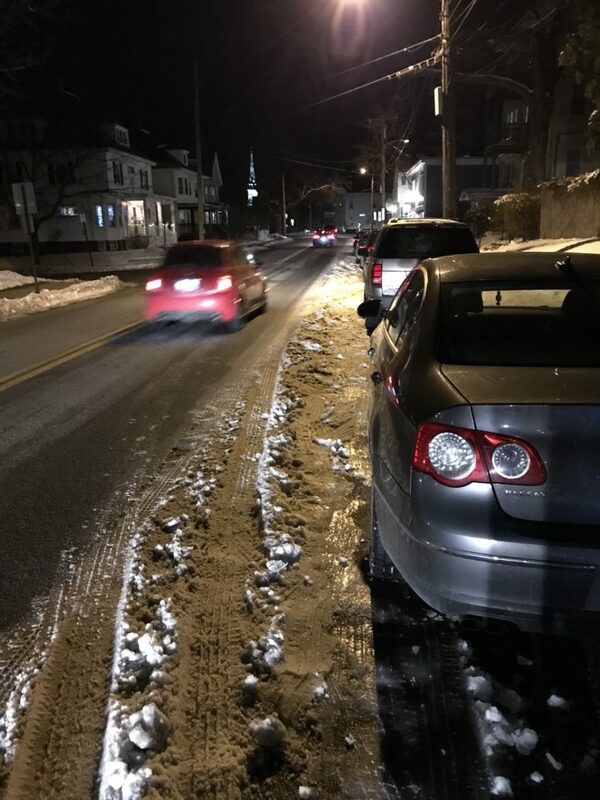 What’s going on here is that the parking lane has not been well plowed, possibly because of cars being parked there when the plow went by. Secondly, the travel lane, which was plowed, has since been even further cleaned up by many car tires traveling over it. If I had any inclination to ride close to the parked cars — which of course, being a savvy cyclist, I didn’t — the snow would have prevented me. 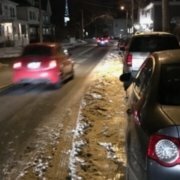 In effect, the snow is creating a very effective door zone buffer! Door zone avoidance guidance on a dry road. This reminded me of the photo on the right, in which you can infer the door zone from observing where the car tire tracks don’t go. The snow works even better! Motorists don’t drive in the door zone. Why should we? Snow changes infrastructure in significant ways. 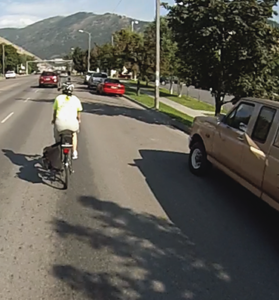 Sometimes, in good weather, even savvy cyclists will opt to use a paved shoulder, if it is sufficiently wide and clear, and the intersections are not frequent. But below is a recent photo of a shoulder I usually use on my daily route, next to a two-lane road that is fairly busy at rush hour. Can you see why I chose not to use it that day? In good weather, this paved shoulder is fairly practicable. Not today. Many people ask me in the winter if the roads aren’t too slippery. 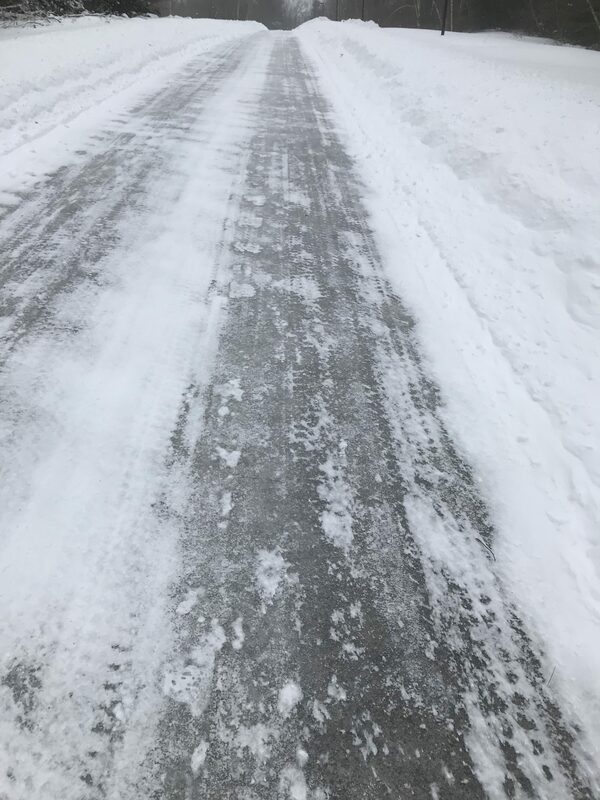 In town, it’s true that many of the neighborhood streets remain slippery a lot of the time, because they don’t have the frequent car traffic that this suburban road has. This road remains clear and dry much of the winter, even when the edge is still slippery. Because much of my commute is on this type of road, I choose not to run studded tires the whole winter. If I did, that would help me to try to use even a shoulder like this. 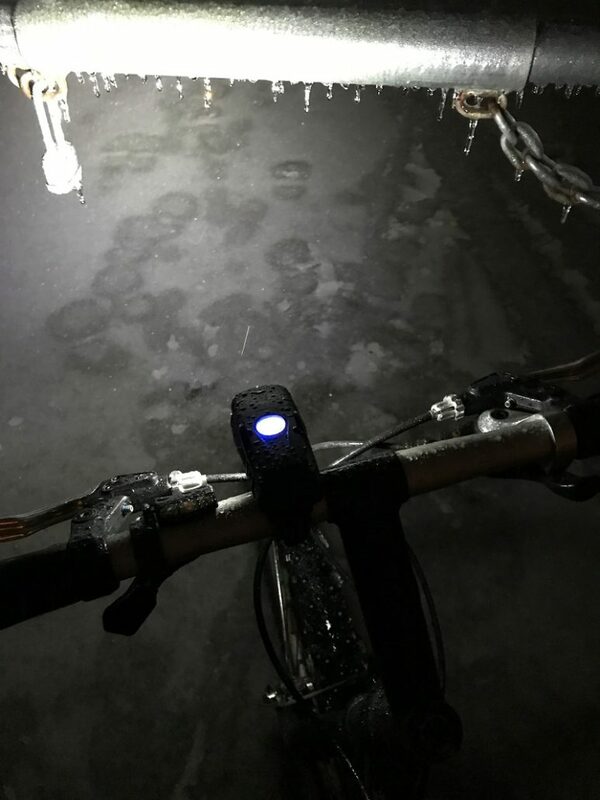 And when people ask me if it’s not slippery, I know they are usually asking from the assumption that I ride at the edge all the time, like most cyclists do. So yes, one solution would be to run studs the whole winter and keep riding on shoulders no matter what. Without studs, I could often still ride slowly and carefully on an icy shoulder like this, or I could practice control and release in the travel lane. Usually I choose the latter, and it works remarkably well — especially because I’m fine with pulling off into a driveway once or twice per trip to let a pack of cars go by if they have built up behind me. Doing this is not legally required in Maine, but it’s a courtesy, and also makes me more relaxed to have the road to myself afterwards. I like to think of it as sharing the inconvenience: I cause some for them, I take on some for myself. I’m not necessarily recommending going without studs on slippery surfaces for your commute. It’s a personal choice, and highly dependent on where you ride. In town, where the roads take longer to clear after a storm, maybe you’ll need them most days anyway. There’s really nothing wrong with using them every day, needed or not. They are just more work, and I’m lazy! An icy private road yesterday morning — a good day for studs! Gated entrance to the same road on the way home — found it was too soft and slushy even for studs, so I turned back and took the main road! Last pro tip on studs: If you can only afford one at first (they’re more expensive than normal tires), put it on the front wheel. It’s more important to keep control with the front wheel, because if it slides, you’ll almost certainly go down. If the back wheel loses traction, you may fishtail, but you’ll still maintain forward momentum and probably be okay. Best to stick with the car tire tracks here. Where do you think would be the best lane position here? If you guessed the tire tracks — you’re right! Often those are the best place to be. But not always. 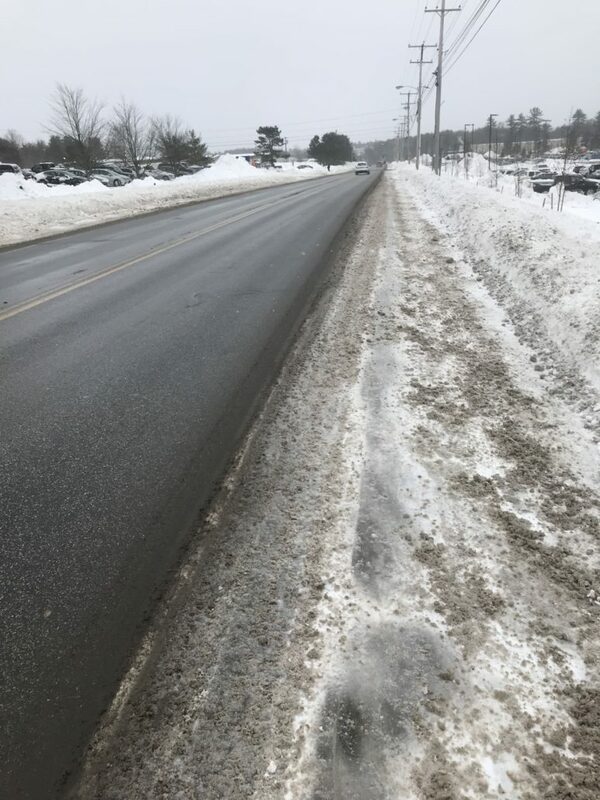 Sometimes the main travel part of the road is all slippery brown slush, and a bit over to the edge in smoother snow is better. In some cases, it’s a matter of slowing down and constantly re-evaluating the best position. This is another good argument for lane control, to give yourself room to move around to find the best place. 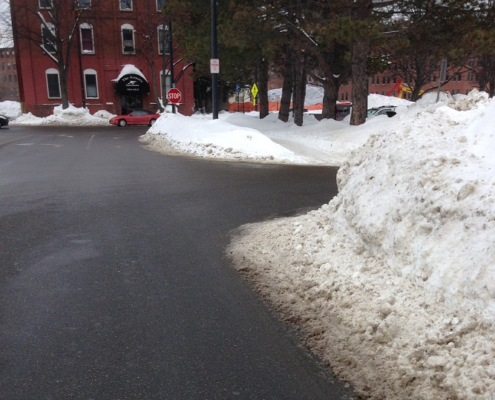 If you are trapped at the side, you have much less flexibility to avoid the even-more-frequent slippery spots there. Speaking of trapped, when you are doing control and release, and decide it’s okay to release, be extra careful monitoring the passing traffic. Those “follow the leader” motorists in the 3rd or 4th car back can decide they can pass too, at the same time that your marginally clean shoulder may be getting less and less usable. Be careful of that pile of snow between the two tire tracks! It can be extremely hazardous. 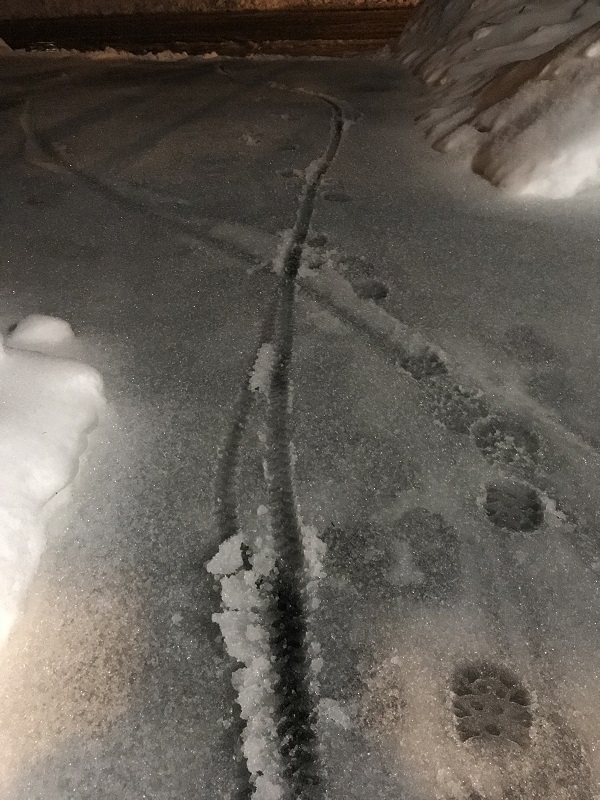 Whether you choose to ride in the left or the right tire track, be really careful if you need to move to the other one. I went down once last winter doing exactly that. It was also on a slight downhill, so the higher speed didn’t help, and the snow in the middle was about 6″ deep. Lastly, vantage around corners — another great reason to be further away from the edge, where it’s easier to see and be seen. Can you see around this corner? Can a motorist pulling out see you? Yes, you can ride in the winter! Be safe and have fun!